I’ve had a lot of small aquariums over the years. Most of them were of the 10-gallon or less variety. When I finally had a bit of room, I decided to go ahead and upgrade to a 29 gallon aquarium. Most of my fish aficionado friends have been telling me to go for 55 or more gallons but I really didn’t have that much room for it, so 29 gallon aquarium it is. And because I didn’t want to buy each and every part that I would need for my new set-up, I opted to go for one of those all-in-one kits. What I ended up with was the Aqueon Deluxe Kit 29. Dimension: 31.8 x 20.5 x 14 inches. All-in-one aquarium set up system complete with guides, filters, lighting and fish food. Glass aquarium with black trim. First and foremost, be careful when you order this item online. 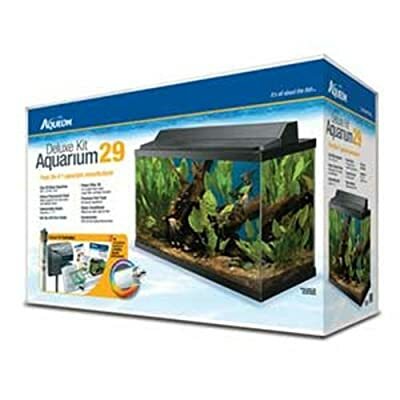 The Aqueon Deluxe Kit that’s the 29 gallon aquarium is item model number 17765. The 10 gallon variety is item model number 17755. If you’re not looking closely, you might make the mistake I almost did. If you’re not as stupid as me, though, then good for you. Let’s move on to my actual review. Okay, so like I already mentioned, I’ve had a number of aquariums in the past. Smaller ones. And when I chose to upgrade to a 29 gallon aquarium system, I didn’t want to buy all the items I needed separately. The Aqueon Deluxe Kit 29 fits nicely into that plan. The fact that it’s so reasonably priced didn’t hurt. The kit has got everything I needed from the actual tank to the filtration system to the lighting system to the actual fish food. Really, the only thing it lacked was the… actual fish. So I ordered it online and waited a few days to get it. Once I got it, I took it out of the box, set it up and had it up and running within hours. It’s all really quite easy. And the kit comes with a setup guide so even newbies can easily get everything up and running on the quick. I’ve had experience ordering tanks online and had a couple of them arrive shattered. It was nice that my 29 gallon aquarium that’s really bigger than anything I ever ordered before came in perfect working condition, no cracks, no leaks. It’s not even labeled fragile. The heater isn’t bad. I’ve been told it’s also safe for saltwater. But at the moment, I’m sticking with my freshwater setup. Maybe I’ll try that out in the future. Of course, having everything in there does have disadvantages. One, I think I can find a better filtration system than what it came with. What’s in the kit is great, don’t get me wrong. It’s just that there are better out there, you know? Also, the lighting system provides roughly a watt per gallon only. Why is that a problem? Because if you’re putting in live plants in there, you can only put in low light plants like java ferns or hornwort. Others probably won’t survive. Low watt per gallon lights.